In the wake of an unprecedented spike in oil train accidents both the US and Canadian governments have introduced regulations to address the dangers of shipping oil by rail. In the US, federal regulators have tightened some rules for oil shippers. On June 7, 2014, in the wake of an emergency order from the Department of Transportation, railroads now have to disclose the times and locations of oil trains to state emergency responders. Railroads that do not release information face a fine of $175,000 per day and risk being banned from being able to transport Bakken oil. Late in 2013, Canadian Transportation Minister Lisa Raitt announced that the federal government would begin to designate crude oil as highly dangerous. This will require new procedures, including placing specialized firefighting equipment along rail routes. Ms. Raitt said she would also crack down on testing rules. Transport Canada quietly approved new safety rules drafted by the railway industry on December 26th, 2013. The rules dropped the requirement that a train with hazardous cargo be continuously attended. However, an unattended oil train must safely apply brakes and the cab must be secured to prevent unauthorized entry. Companies are required to file special instructions with the department governing the testing of hand brakes. For the most part the new regulations focus on mitigating the effects of an incident after it happens. 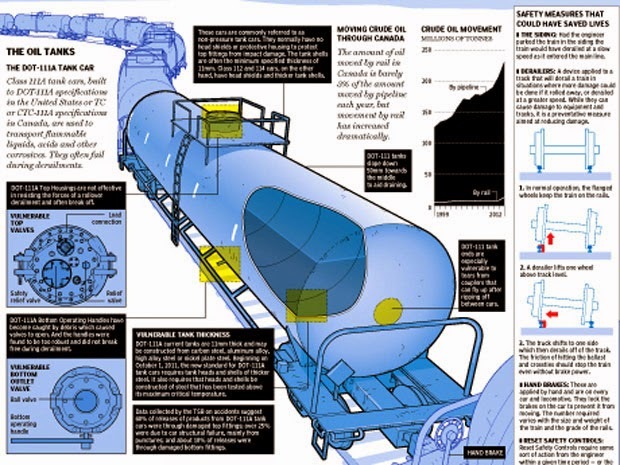 On Wednesday April 23, 2014, Canada's Transport Minister announced new rail safety regulations which will eliminate or force a retrofit of the DOT-111 tanker cars. Tanker cars bearing oil now need a thicker, more puncture-resistant outer-shell jacket around the entire tank car, and thermal protection. They will also have to have extra-protective head shields on both ends. The estimated cost for replacing and retrofitting could exceed $1 billion. Industry figures suggest there are as many as 228,000 DOT-111 railcars currently in operation across the US.